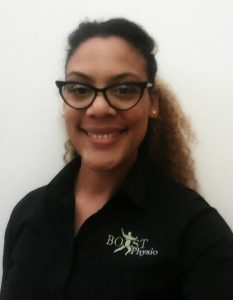 Our latest addition to our team, Sports Physiotherapist Abi, tells us how her experience working with Elite Athletes prepare for competitions like the London and Rio Olympic Games, has made her a better physio. I have worked with many talented young sprinters, but one stands out. I contributed his therapy care plan and supported the strength and conditioning coach to build his physical and mental robustness. This year, he was selected to represent Great Britain at the World Championships. How do you put your experience in Elite Sport to practice in the BOOST environment? There is a culture in elite sport that the athlete should perform better following their rehab programme. I therefore have the mindset that it is possible to make any individual stronger, more resilient and in a better position than they were in before their injury. Tell us about the sport or hobbies you enjoy and why you enjoy them. I generally enjoy being active and have dabbled in many different sports from gymnastics to swimming. At the moment, I am really into Yoga, Pilates and High Intensity Interval Training. These activities make me feel powerful, energised and most importantly, balanced. Why should a patient come and see you for their injury? I am a physiotherapist that will actively listen to my clients and prioritise their needs. I find that this, coupled with my experience in Elite Sport, knowledge and skill set, always results in the best outcome.